With VND46.8 billion (US$2.1 million) allocated to Tra Vinh from the Government’s poverty reduction programme this year, the province has built and repaired 71 infrastructure works serving Khmer people’s production and daily activities. In addition, health care and education services in the province have been improved, with an increasing number of Khmer students attending schools at all levels. In the 2015-2016 academy year, more than 58,390 Khmer students entered high schools, accounting for 31.40% of the province’s total learners. 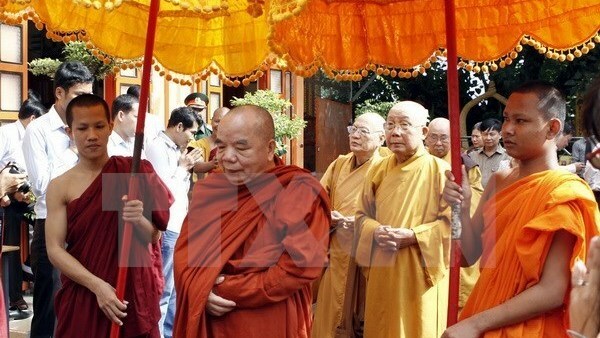 On the occasion, the province presented gifts worth over VND400 million (US$18,020) to poor Khmer people. It is held from the 30th day of the eighth lunar month to the second day of the ninth lunar month each year, which falls on October 12-14 this year, during which Khmer people pay tribute to their ancestors and take part in community celebration activities with traditional songs and dance after a hard working year.